Smokey quartz is available in a wide variety of cuts, shapes and sizes. Our collection below shows some of its wonderful variety. 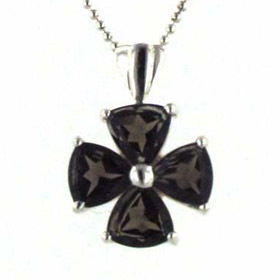 Often when you hold a smoky quartz pendant to the light, it has amber glints in the stone which add to its richness. All our smokey quartz pendants feature natural gemstones. Be it bold or dainty, choose from our Italian sterling silver chains for a special chain to hang your smoky quartz silver pendant. Smokey quartz pear drop pendant claw set in sterling silver. Large oval smokey quartz pendant in sterling silver.